It wasn't until Alexander was born that we had to put locks on the cabinets. It was Alexander who began climbing the walls and furniture as soon as he learned to crawl, not my girls. Alexander has no fear. He also tells me "no" more often than he should. It is also Alexander who learned to climb IN and OUT of his crib in one day! 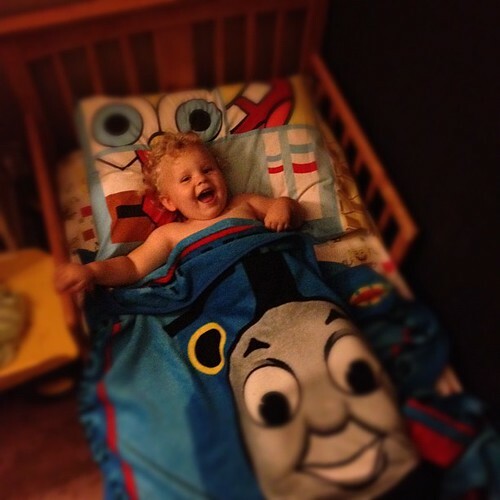 For fear of what would happen, we had to make a hasty decision to remove Alexander's crib and put up his toddler bed. In the middle of the week, with no preparation what-so-ever! It was tough. It was so unexpected and I was sad. After six years of having a crib up and raising three babies in it, it came down and went into storage. It's the last remaining piece of "baby" equipment that I own. The rest of it was sold over the summer or donated. A new chapter has started for Alexander. And for all of us. My babies are growing up and there is nothing I can do to slow them down. Don't worry. The grandchildren come sooner than you can imagine, and they are twice as much fun as your children. OK, maybe not, but you have time to be aware of how transient is childhood by the time they arrive, and can treasure every moment. My Lily is exactly like him. Into everything, and climbs on everything! Must be a third child thing!